Proton slamming has resumed at the Large Hadron Collider (LHC). 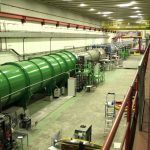 Almost a fortnight after the collider began circulating proton beams for the first time in 2018, the machine’s operations team has today steered beams into collision. While these are only test collisions, they are an essential step along the way to serious data taking, which is expected to kick off in early May. On Friday 30 March, at 12:17 pm, protons circulated in the 27-km LHC ring for the first time in 2018. The Large Hadron Collider entered its seventh year of data taking and its fourth year at 13 TeV collision energy. New experiment at CERN shows first results - scientists hope for further data analysis for the search for new physyics. In February 2018 at the ATLAS collaboration meeting the PhD thesis of Philip Sommer and Markus Zinser were awarded with the ATLAS Thesis Award. The ATLAS Thesis Award honours excellent research and contributions from PhD students of the collaboration.This year a total of five awards were granted. The ETAP CALICE group is hosting the CALICE collaboration meeting in the halls of the "Alte Mensa". 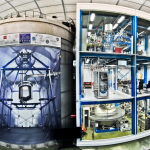 Around 50 physicists from around the world are expected to present and discuss the latest developments for the detectors for a future linear collider within the collaboration. Dr. Christian Schneider, project leader for the areas "school students program" and "science communication" for the excellence cluster PRISMA of the JGU reported live in SWR2 on the Guiness world record, his fascination about giving school students an understanding of physics and on the ability not to talk about physics all the time at home. Now the most sensitive dark matter experiment world-wide can much better listen for the very weak voice of dark matter.